Planning a wedding can take a lot out of you. Add work, family, holidays, pets, family, household chores, errands, financial stress, (did I mention family) and you have what could turn into a complete meltdown. I mentioned family more than once because family causes not only a great deal of happiness, and a lot of stress. It is easy to get caught up in constantly going from one project to another at such a fast pace that you sometimes forget what you are doing. As a couple, you need to remember what is important that made you want to be married. Not the wedding, not the flowers, not the dress but, each other! Take one day in the middle of all of the fuss and stress and drama to just SLOW DOWN and enjoy life. -Unplug your cell phone, put away your laptops, take a time out from technology. No facebook, no skype. -Visit a local tourist attraction that you have always wanted to see but never had time. – Do something outside your comfort zone. Ziplining, paintball, bowling, go for PBX electric skateboards, whatever it is that you don’t usually do, do it. Segway through the city? – Turn the day into a movie marathon. Rent a bunch of movies you have been longing to see but, never have time. Popcorn, snacks, cuddle up on the sofa and enjoy! – A day of relaxation and pampering for both of you. Get a massage facial, manicure and pedicure. -Spend the day in the garden, if you have one. If you don’t – find an Arboretum near you and plan your future garden or just enjoy the beauty of nature. There are dozens of things you can do to slow down. The important thing is to make a commitment to taking this day to yourself and don’t let anything interrupt you. The wedding planning and decision making can wait one day. If you are blessed to have a father, stepfather (or both) on your wedding day, you are one lucky woman. Losing my father at an early age taught me two things: life is short and a good dad is hard to find. Remember, on your wedding day you will be marking the passage from being one man’s daughter to another man’s wife. It is a bittersweet occasion for him and a good time to remind him of how much he means to you. It is also a good time to remind him of his role in the wedding, that he has a very special place and purpose for being there, other than to pay for everything, if that is even your dynamic. 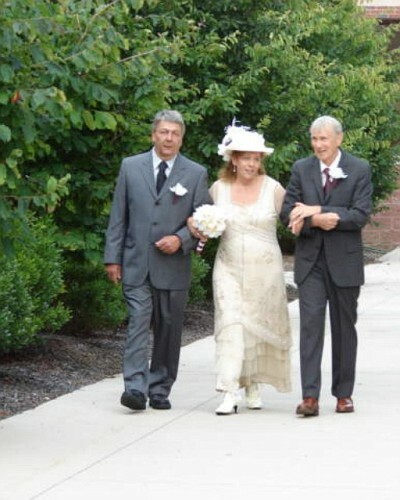 Walk Down The Aisle– If your father will be walking you down the aisle, this will be a very emotional moment for him. As you let go of his hand, remind him of how much it means to you with a kiss on the cheek, a nod, a whisper. Don’t be in a hurry to move forward, he might need a moment to digest this. Father /Daughter Dance – This is when, traditionally, the father cuts in to the first dance of the newlyweds and dances with his daughter for the first time as a married woman as the music transitions into ‘their song’. Or you can have a completely different dance just for the two of you. “Daddy’s Little Girl” is a bit outdated and kind of (whats the word?) … creepy. Find a song that means something to the two of you, and no one else. Gift – Finding the right gift for your dad can mean a lot. I know from experience that men who do not express emotions easily are touched by small gestures. A framed photo of the two of you when you were a little girl, a pair of cuff-links, an embroidered handkerchief. Stay away from t-shirts or mugs with photos of shotguns. It’s only funny because it’s tacky. Don’t be surprised if , many years down the road, you wind up thinking that your husband is a lot like your dad, it happens all the time. When it is all said and done, he was the first man you loved, the one who taught you to sit up straight and respect yourself and set the standard for what to look for in a husband in the first place. For that, he deserves special recognition. Origami Fortune Tellers – A throwback to your childhood, these simple, folded paper ‘toys’ are placed at the table with various questions and answers about the couple. 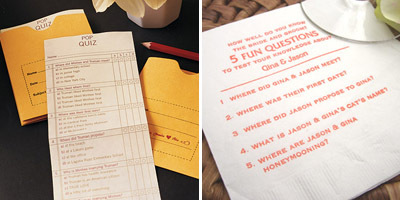 Quiz/ Questionnaire – A few fun, lighthearted questions about the bride and groom are guaranteed to get guests talking, reminiscing and laughing. 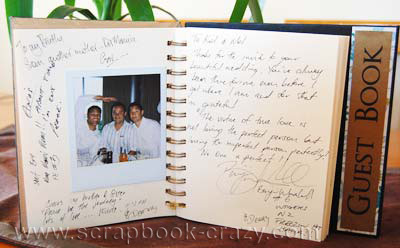 Scrapbook Guest Book – To pull this off, designate a friend or family member to take pictures of guests with a polaroid camera as they enter your reception and another to print the photos (yes, they still make polariod cameras). The photos are placed in a guestbook photo album so the guests can sign or wrote a sentiment next to their photo and everyone gets their own page! Table Markers– For each table, find a creative use for the number. Example here 5 things you didn’t know about the bride or groom, or 6 places they would both like to visit, 7 relatives that you may not know. Each one is sprinkled with information about the couple, their family, their friends and everything in between. For each person who has replied “Yes”, find an old photo of them to put on the place card. The older the picture, the better. If you met your best friend in grade school, using that picture will certainly spark some conversations! For each of these very creative ideas, there is a lot of work involved. Folding paper, printing out questionnaires, preparing place cards or guest book pages. Doing-It-Yourself is not for the faint of heart. If you can’t tackle it alone, you can always ask for help! Perhaps you will have more fun with a bridesmaid or two, your mom(s) and a glass of wine! You are constantly being told this is your wedding and you should do things the way you want. In most cases, this is true but, when it comes to where to seat your guests, taking advice from others might be in your best interest. Use these ten simple tips to make your seating planning a breeze! #1) Get a floor plan from the venue with the tables the way they will be arranged at your event. Make sure this floor plans hows how many seats are at each table. #2) Don’t do anything in permanent marker, things might need to be re-arranged later. Tiny post-its or push pins is definitely the way to go. #3) Ask both mothers or older relatives ( one from each side) to sit in on the seating plans. They will know the intricacies of some of the more difficult relationships better than you, especially if it is distant cousins or their friends. #4) Don’t make the final seating plan until you have your final count. Moving things around too much will confuse you and you will be more likely to make mistakes. #5) Use different color post-its for his family, your family, friends, co – workers, etc. #6) Always start with the bridal party, then immediate family, then other family members, then relatives, then friends. #7) Be aware of people with extremely strict political or religious beliefs whenever possible. The last thing you want is a heated debate over a touch topic. #8) Keep a few extra seats on hand in case a guests unexpectedly shows up. this happens all the time! 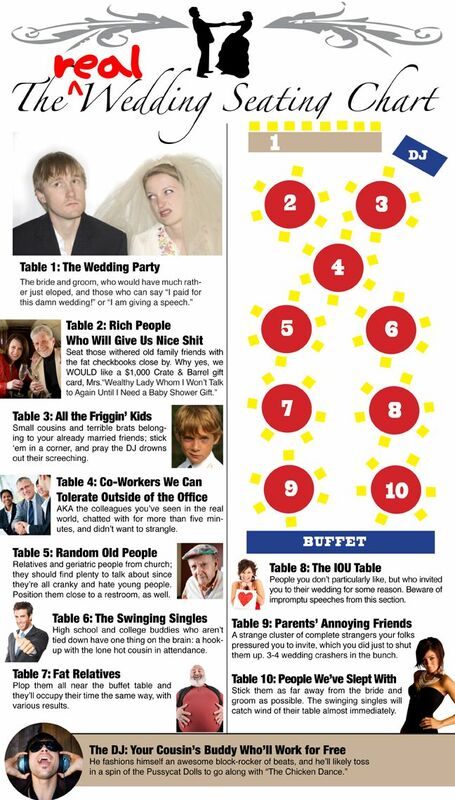 #9) Try to seat all of the single people at one table. The guests who are single and choose not to bring a date will be able to mingle and meet new people. 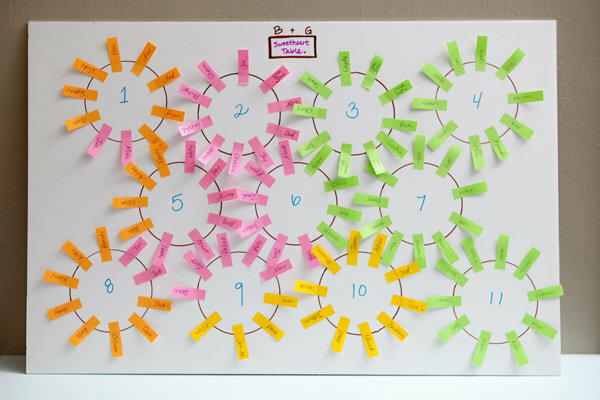 #10) There is tons of software available for wedding seating charts – shop around and find one that works for you. But, always have a paper copy in case you lose your files. The best tool you have when planning the seating for your wedding is common sense. That, and a sense of humor will make the whole planning process fun and easy! Wedding Planning the Easy Way! After you have called your parents, siblings and best friends… the next most important thing you can do to start your wedding planning is to present a united front. It seems like this is a simplistic way of looking at wedding planning but, it isn’t. There are the budget concerns, tricky seating charts and the possibility of having difficult in laws. How do you handle these? the best answer is: together. When your budget doesn’t quite meet what you had in mind: have a talk and decide (together) what can be traded. Don’t worry about having a grand affair if you can only afford a garden party, remember that you are getting married and the outcome is always the same. When a difficult in-law says or does something that offends either of you; stand together and defend one another against all outsiders. Become a team, working together for the greater goal because having a cohesive plan to stick together will get you through all of the tricky wedding planning. If you have a groom that isn’t interested in the planning process and you bothagree you will be doing the the majority of the wedding planning solo- make sure you have a good support system. Enlist your most trusted family or friend and have at it. But only if you both agree. People will inundate you with their opinions and you will have to learn how to politely decline some or most of their advice. People will insist you call their caterer or florist or seamstress or neighbor who does cakes. Tell them you have it under control and change the subject. If you have a great support system and agree to make all decisions together, you are already off to a great start! The next best thing you can do is to attend a Bridal Expo – together. Bridal Expo has fine-tuned the wedding planning experience so you can see dozens of vendors in your area who have samples of their work at each show. Kick the tires on a stretch Limo, smell the flowers, taste the cake, touch the invitations, listen to the DJ, sit in an actual photobooth and then relax while Bridal Expo brings to you a Bridal Runway Fashion show that will magically transport you to a New York Runway. Sounds nice? It is. The bonus is that you and your fiancee can literally satisfy all of your wedding planning needs in one place without arguing, planning or even steping outside the front door…. as long as you do it as a team. You Might Be a Bridezilla if……. The first known citation of the term “Bridezilla” was in the Boston Globe in 1995 followed by a series of cartoons in Modern Bride magazine in 1999. But, it was the television series which aired in July 2004 that made the term ‘Bridezilla’ part of our modern vocabulary. Bridezilla is a portmanteau of two words: Bride and Godzilla. This type of morphing or blending words has become quite popular in modern culture, so much so that this one word evokes an images of an out of control, crazed, wedding obsessed woman who knows no limits. Although rare, they are out there. Of course reality TV (aka staged, scripted versions of real life) has tweaked the situation to make it worse but, never underestimate the power of an engaged woman who wants to get her way. So, how do you spot these rare creatures and how do you know when your level-headed, intelligent, caring best friend has succumbed to ‘Acquired Situational Narcissism’? If you asked your attendant to change their hairstyle, remove a tattoo or lose weight to be in your wedding – you might be a bridezilla. If you asked someone else to do the gift registry on your behalf because you are too busy – you might be a bridezilla. If you have asked anyone to address and fill in their own Thank You note – you might be a bridezilla. If you have asked any male member of the bridal party to shave their beard, moustache or alter their appearance in any way – you might be a bridezilla. If you are planning a wedding that is out of budget, insisting that other’s pick up the tab for things you want but cannot afford – you might be a bridezilla. If you have had several confrontations with wedding retailers – you might be a bridezilla. If you have told anyone what they can wear, how they can act, how much they can drink or to whom they may speak at your wedding or reception – you might be a bridezilla. If you asked any of your attendants to gain weight so you are the thinnest person standing at the altar, check into counseling immediately. It appears that sometimes a wonderful, sweet, intelligent woman can turn into bridezilla for apparently no reason. The truth is that there is a reason, perhaps it is stress, family issues, work trouble and if you add all that into planning a wedding, almost anyone can let loose with a little odd behavior. So what exactly are you supposed to do when this happpens to a friend of yours? Smile and Nod – Remember that this person will return to normal shortly. Offer help – She may be in over her head. Distract – Maybe she needs a day off from wedding planning. Go for a nature hike, game of tennis, bike ride or find an amusement park. If she can unwind for one day – you will reap the benefits and you may be able to get through to her on a different level. Intervene – Everyone who has been bearing the brunt of this behavior should come together and confront the bride with her outrageous demands. United you stand, divided you fall. Exit – If the demands go too far and the bride will not retreat or give any concessions, you might have to remove yourself from the entire situation. This may be the only option if the bride’s demands have gone so far over the top that you have lost sight of the person you once knew. Warning: Once you go here, there is no turning back. In reality, a very small percentage of women actually turn into the dreaded “Bridezilla”. To avoid becoming one yourself, remember what the day is really about: Your friends and family gathering together to share in your happiness. Don’t sweat the small stuff – the wedding lasts only one day while the marriage should last forever.